The Bird TLC Education Committee has just notified me that I am having a new addition to the family. No, not the pretty blonde on the left. 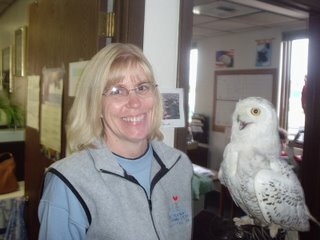 That's Cindy Palmatier, our Rehab Director. Her husband Todd and my wife Ruth would probably have something to say about that. However, the snowy she's holding will be moving to our house as soon as I get a new mew built in the backyard. At that time I become it's caretaker. Here's a link to more images. The mew must be built before the snow flies, which will probably be in a few weeks. It will be 12 feet long, 6 feet wide and 8 feet tall. So, I need to get busy. Most of Bird TLC's Education Birds live with their caretaker. The caretaker takes on most of the birds expenses like housing, food, etc. After the mew is built, I'll be in training with the bird until I prove to our Education Committee that I can handle the bird under any situation and am very knowledgeable of it's species. Then I'm required to do 15 hours of educational presentations a year with it. I'm going to be busy. This all started 4 1/2 years ago when I took my wife Ruthie to the Bird TLC Clinic to do "her bird thing" after we had a bad snow and her car wouldn't make it through the unplowed roads. If you would like to read a female version, visit Susan Get's Native in Ohio. She does a lot of the same bird stuff we do here in Alaska. It's great to read someone else's stories on the same topic but from a little different view.